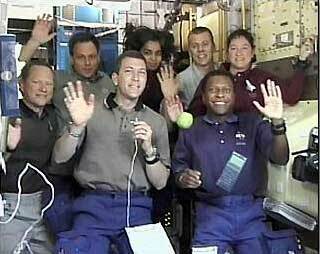 Shuttle breaks up at end of science mission with first Israeli astronaut (Ramon). 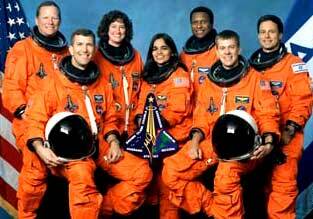 Crew: Husband, McCool, Chawla, Brown, Anderson, Clark, Ramon. 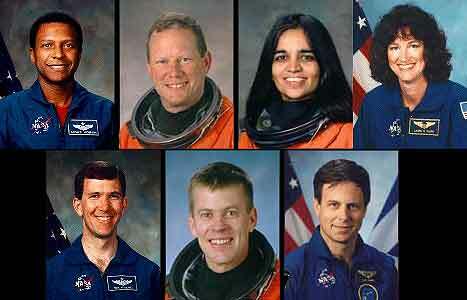 The end of shuttle mission STS-107 was a devastating blow to the nation’s space program and a horrific reminder of the dangers of manned space flight; just in the last week, NASA observed the anniversary of the 1967 Apollo 1 fire (Jan. 27) and the 1986 Challenger explosion (Jan. 28). Although “our entire nation grieves,” said the president, who ordered that flags be flown at half-staff through Wednesday, the astronauts’ deaths will not spell an end to space exploration.